Flipboard for iPad is amazing. Throw your Facebook, Twitter, and favorite websites in there and you've created a digital magazine just for you. I suppose the logical next logical step was the iPhone. It's not as spectacular on the iPhone as it is on the iPad. But what do you expect when you take a tabloid magazine and turn it into a 'zine? Create a virtual flip book of sites and social networks. Users navigate their digital magazine by swiping through stories and sharing their favorites directly from the app. Flipboard has been on the iPad for a while and the iPhone version came out last week. But, because of the iPhone's larger user base, the amount of "flips" generated by the iPhone version of the app is already double that of the iPad version. 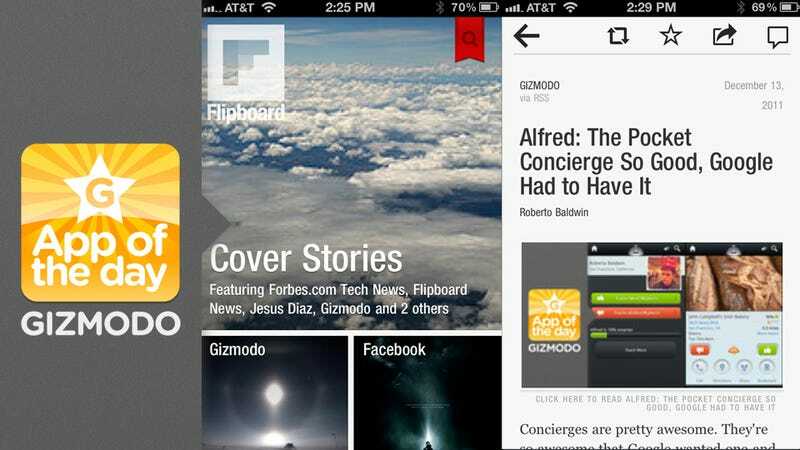 It's Flipboard on the go. The iPad is too bulky to whip out on the bus on the way to work. I'm sure some people do it. But come on, you have your iPhone everywhere you go. The app does feel cramped on the smaller screen. The app still has the fluid experience we expect from Flipboard. And it's a great way to check all of your favorite sites in one app.